Koffee with Karan, the go-to place for all gossips and inside information in the film industry is here with its 6th season. 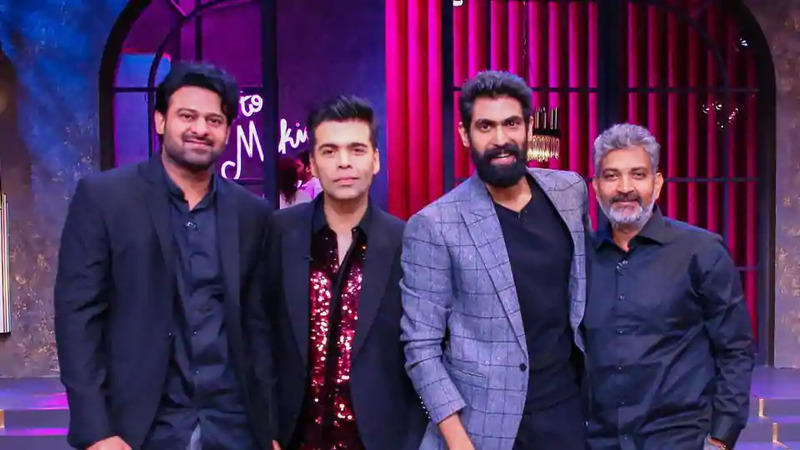 This time the lead men of the Baahubali series, Rana Daggubati, Prabhas and the director himself, S.S Rajamoulli were spotted on the show. The episode was full of fun and several of the personal details were opened up to the public by all the three guests. The director spoke up about the differences between the two actors Prabhas and Rana and about their habits. Rana Daggubati opened up about his break up with Trisha. Rana had been dating the actress Trisha Krishnan and they had broken up recently. Rana and Trisha’s relationship had been the talk of the town. Rana admitted saying that both of them had been very good friends for a very long time and that they also had been dating but then they parted ways later as things did not work out between them. Rana said that they have been friends for about a decade. He admitted that currently his relationship status was single. Prabhas who is very rarely seen on talk shows was also seen opening up about his life on the show. He finally gave an answer to the rumours doing rounds about him dating Anushka Shetty. He replied a ‘No’ to the question of whether they had been dating. He was of the opinion that if any two people have been working together for years, they will be linked. He reconfirmed that he and Anushka were not dating. He also told Karan to ask Rajamouli if he still had the doubts. Rana also voted in for Prabhas saying that he and Anushka had not been dating. When Karan told that she was seen playing his wife and his mother in the movie and thus it was complicated, Prabhas chipped in with the reply of ‘Exactly, see, how can I date her.?”. This cleared out the long-time rumour in the industry about Prabhas and Anushka’s dating. There were several other revelations by the stars. Rajamouli revealed about the characters of both the actors, he said that Rana Daggubati was more of an extrovert kind of a person who loved to party and was more social , surprisingly and on the contrary Prabhas was comparatively a more shy person who does not interact much in spite of being such a big star. Rajamouli said that Prabhas was a huge foodie and he regularly treats his close ones with huge meals at his farmhouse. Rajamouli was of the opinion that it would be Rana who would get married first among the duo. He said that Prabhas wouldn’t be getting married as he was lazy. He said that the process of finding a girl, preparing the invitations and calling people, the ceremonies would be too much for the lazy person that Prabhas was. On being asked about the Baahubali series and the widespread response that it had received, Rajamouli revealed that they had not expected the movie to become such a huge phenomenon and that they were surprised after the first Baahubali movie seeing the response from the audience. Rajamouli had been particularly amazed by the “Why did Kattappa kill Baahubali” question that was spreading like wildfire on social media. On being asked to name a Bollywood actress he would love to set up Prabhas with Rana replied Katrina Kaif and Prabhas on being asked the same question told that he would like to set Rana up with Trisha . These were some of the interesting talks that had happened on the show. The gossips about Rana and Prabhas’s relationship statuses were cleared. The episode had been a fun filled one with the three superstars being their own selves.